September 20, 2016 update: Metrolinx has begun the process of demolishing its newly-acquired Downtown Brampton properties. It has applied for a demolition permit for 28A and 28B Nelson Street West, two semi-detached dwellings that were built in 2001. In the City of Brampton, demolition permits for residential properties must be approved by the Planning & Infrastructure Services Committee. The permit will likely be approved at the September 26, 2016 meeting of that committee. On April 5, 2016, Peter Criscione at the Brampton Guardian reported on a matter that arose during the regular meeting of the City of Brampton Planning & Infrastructure Services Committee on April 4. Metrolinx, the regional transit authority that operates GO Transit and UP Express, confirmed the purchase of 1.78 acres in Downtown Brampton, land that will be used for surface parking. Brampton Station, served by GO Transit and VIA trains, is located in Downtown Brampton, and is adjacent to Brampton Transit’s downtown transit terminal. With local shopping, restaurants, residential areas and employment, it is one of the most walkable stations in GO Transit’s system; it has a Walk Score of 90. (Bramalea GO Station, in comparison, has a Walk Score of 22.) The options of getting to Brampton Station without a car are quite good, at least as far as most GO stations go. But Brampton Station’s two lots are full, and there are planned service improvements to Brampton, including eventual hourly evening and weekend rail service. Not everyone can be expected to take transit, walk, or get a ride to the station. But I find this land assembly troubling. The planning committee asked staff to contact Metrolinx and report on the status of its recent and pending purchases of downtown lands. It also invited Metrolinx to work with city staff and officials, as well as present their plans at a future meeting. The purchase of downtown lands for a parking lot is troubling, in my opinion. Downtown Brampton is a designated “anchor hub” — a major mobility hub where two or more rapid transit lines meet where transit-oriented development and intensification is encouraged. At no point do I see new surface parking lots are part of this vision, especially if buildings must be vacated and demolished to do so. And Downtown Brampton, not yet experiencing a building boom, has plenty of parking lots and garages that could be employed instead. The embedded Google Map below shows where these properties are located, immediately south of Brampton Station, and west of the Brampton Transit downtown terminal. On Friday, April 8, I visited Downtown Brampton to have a look at the properties in question. 20 Nelson Street West and 37 George Street North are two separate four-storey office buildings built in the late 1970s and early 1980s. Both are occupied by local community service agencies, a career college, a printing office, and medical and dental offices. Local MPP Vic Dhillon (Liberal – Brampton West) has his office in 37 George Street. However, there were a number of vacant offices among the tenants. Both buildings are managed by Degauss Business and Property Services, a small property holding and management firm. 37 George St. N. in foreground, 20 Nelson St. W. on left at the corner. 26 Nelson Street West and 3 Railroad Street are both parking lots serving the office buildings. 28A and 28B Nelson Street West is a semi-detached house, built in the late 1980s or early 1990s. Both sides were recently vacated; notices from the City of Brampton about local road construction were left taped on both residences’ front doors. 30 Nelson Street West (pictured above), according to a Brampton Heritage Board report, was built in 1870. In 2015, the large house was a candidate for heritage listing. The heritage report noted that this property was owned by Degauss Business and Property Services, the same managers of the two office buildings on George and Nelson Streets. 30 Nelson Street was also vacated when I visited last Friday. Above, 42 Elizabeth Street North. Another house occupied in previous years (thank you, Google Streetview!) but vacant in 2016. I heard that 46 Elizabeth Street North was one of the properties sought by Metrolinx elsewhere, but this dwelling — currently a rooming house — remains occupied. It is not on either the list in the Brampton Guardian, or the city’s list. According to Peter Criscione’s article, the properties acquired by Metrolinx “provide ‘flexibility’ for a mobility hub at some point in the future.” But this is rather vague. Last autumn, I wrote about GO Transit’s problem with providing seas of free parking, and building massive parking garages. Parking is expensive to build and to maintain. And all passengers — whether they drive or not — pay for those costs as part of their fares; the provincial government (and with some federal funding) pays for capital expenditures, such as land acquisition and parking. There are other options. Wandering around Downtown Brampton, I noticed other vacant lands and half-empty parking lots, privately owned and owned by the City of Brampton. Instead of purchasing, bulldozing, and clearing existing buildings, why not lease parking spots from the City of Brampton? Or purchase this empty lot on Nelson Street, pictured below? It’s for sale. 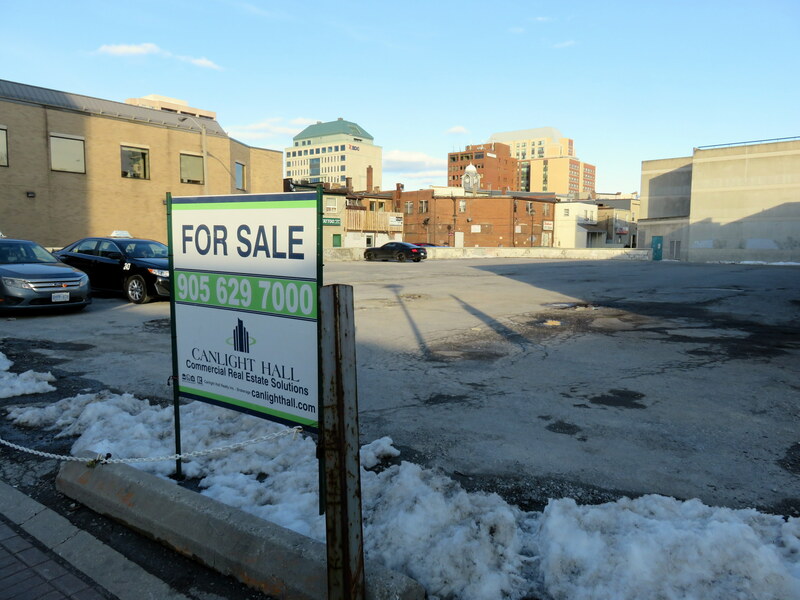 Lot for sale on Nelson Street West, across from the transit terminal. The Nelson Square Garage and lot also has plenty of room. Or, why not expand parking at Bramalea Station, perhaps build a parking garage there? Bramalea is planned as the terminus of GO RER train service; this is because Metrolinx owns the rail corridor up to that point, and can run frequent rail service without interference with CN freight traffic. Located in an industrial area, near Pearson Airport flight paths, Bramalea is well suited for additional parking, rather than urban development like Downtown Brampton. Finally, while I agree with Brampton’s concerns with building a new surface lot in Downtown Brampton, I feel that without fully committing to proper transit links, such as the Hurontario-Main LRT, local politicians need to share some of the blame. How can municipal politicians claim on one hand to support an anchor mobility hub in Downtown Brampton when they can’t commit to building good transit to it? And if there’s not enough transit, is it a surprise that Metrolinx wants to add parking to serve its customers? I will continue to follow this story. I look forward to Metrolinx’s presentation on the future of its newly acquired downtown properties. This entry was posted in Brampton, Transit, Urban Planning and tagged Brampton, Downtown, GO Transit, Hurontario-Main, LRT, Metrolinx, Mobility Hubs, Parking. Bookmark the permalink. The Archives has a photo of what was then the “Federal Building” being constructed in 1975. Thanks for digging into this Sean, this seems like a really misguided plan by Metrolinx. You do not need to build more parking at Bramalea as the lot, at least the south lot, has lots of empty parking, but getting to it is a pain as is the walk to the GO station. [How can municipal politicians claim on one hand to support an anchor mobility hub in Downtown Brampton when they can’t commit to building good transit to it?] That’s a conundrum based on something illogical to begin with. In revisiting the discussion of GO building parking lots (most of which is free), I’m reminded of the adage: “Build it, and they will come”…no, “they will drive”. If building more parking at Bramalea is a potential solution then whoever does this can take credit for more traffic congestion in Brampton. 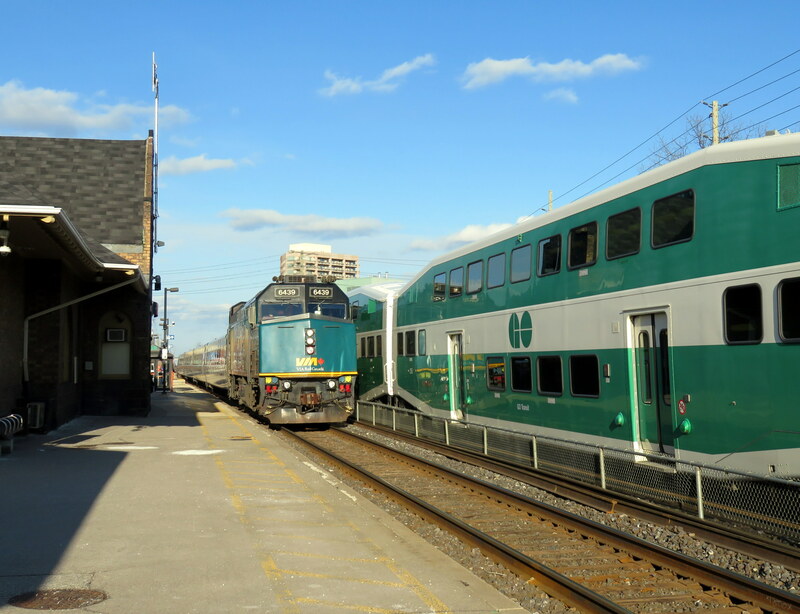 It is a tacit acknowledgement of what the stats tell us…for some reason GO train riders far prefer to drive to the train as opposed to other methods of getting there. So if the solution to that is to invite people from all over Brampton to drive to the South East to get to their train then this additional parking (along with the cheaper fair from Bramalea they would see) is going to just add to congestion on city streets. Perhaps the reason that leasing the lot on Nelson across from the terminal is because it is for sale. No doubt, GO is looking for a long term solution to parking at the DT location……a short term lease on a lot that is for sale may not be that solution. As for Transit to DT station….it is already very good. I use the station and it is now over 5 years since I drove to it. To blame the city because they did not approve the LRT is weak. How much time would someone save getting to the station from anywhere between Nelson and Steeles if the LRT replaced the already very good bus service that is there now? Hardly any….so why assume that there is this large cohort of people sitting in their homes thinking “I would use public transit to get to the GO station if it was railed not those nice buses? Nah, I think I will drive”.